The importance of a Single Source of Truth. How much time do you spend each day looking for files? Have you ever wasted time working off the wrong version of a document? Or had to recreate someone’s work because no one can find the original file? 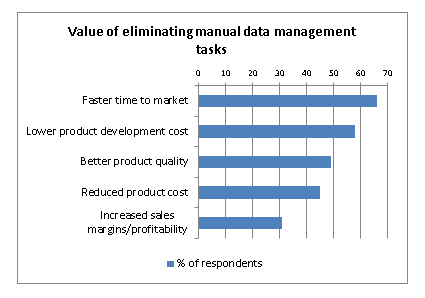 A Study by Tech Clarity found that engineers spend 32% of their time on non-value added work. That’s over two hours wasted in an eight hour shift. 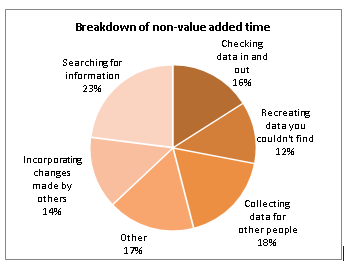 The breakdown of the non-value added work lists recreating data, incorporating changes made by others and searching for information – all effects of ineffective file management. A surveyor downloaded what she thought was the latest survey plan from an email. After flying to the site, she spent the next week completing the survey plan. Only to find out once she submitted her results that the plan was the wrong version, and she’d surveyed the wrong area. The company lost over a week, had to reschedule the survey, and delayed the update to the mine plan. 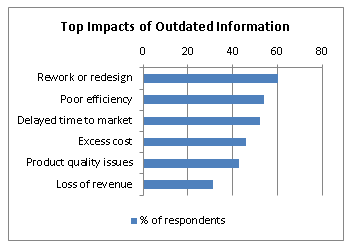 The cost of ineffective file management isn’t always time – it can also affect safety. A recent conversation with a customer revealed a startling near miss. The mine design had been updated in one system, but the updates weren’t shared with the mine planners, who were using a separate system. Thus, the geologist didn’t have latest data. A new drift location wasn’t on their maps. While the operator was following the new plan, the drill-holes in the plan went through that new drift location – at the same time miners were working at that face. Thankfully there were no injuries, but the safety audit clearly identified the outdated file as the cause of the incident. To eliminate the costs of ineffective file management, you must establish a single source of truth that includes check in/check out capabilities and version control. To unlock the true value of collaboration, however, you need to tie your data to your business processes in one seamless environment, connecting people, data, and ideas. That seamless environment is available now, with the Dassault Systèmes 3DEXPERIENCE platform. Combined with GEOVIA’s mining expertise, the 3DEXPERIENCE platform enables Zero Distance between departments, sites and companies, establishing the single source of truth, eliminating silo’s, and enabling true collaboration. Connect your mining organization to the Dassault Systèmes 3DEXPERIENCE platform and collaborate with others in real-time. Whether you’re working on projects together, sharing data, viewing 3D models, or reporting end-of-month figures, it’s possible with Social Collaboration and Enterprise Collaboration from Dassault Systèmes and GEOVIA. Watch for more on these other areas of collaboration in future blog posts. The mining industry is at a tipping point – to survive and thrive, mining companies need to look towards technological innovation to drive productivity and collaboration. Learn more about the 3DEXPERIENCE platform from Dassault Systèmes, here. Senior Portfolio Manager | Jessica is a product manager with more than 16 years of experience in industrial enterprise software. Her areas of expertise include product strategy and business value definition, with a focus in workforce management, short-term scheduling and optimization, and execution. Based in Vancouver, Canada, Jessica joined GEOVIA in 2017, leveraging her background in enterprise software solutions for mining and utilities in the GEOVIA Earth Resources Management discipline.